I arrived at the City of Fredericksburg, Va, on a quiet and foggy rainy day in December 2012. 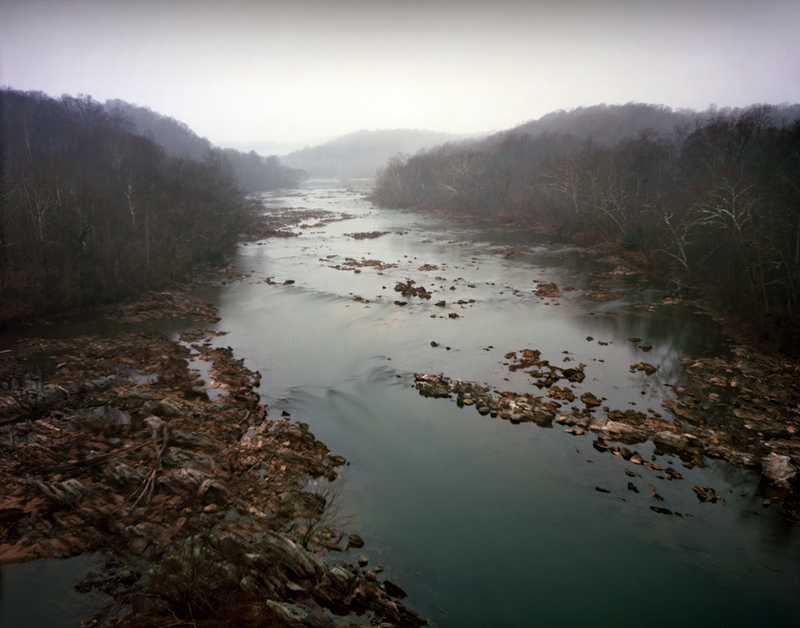 150 years ago, General Ambrose Burnside and the Union Army woke to the same weather as they camped along the Rappahannock River opposite Fredericksburg. Gen. Burnside, at the urging of President Lincoln, planned to attack the Confederate forces at Fredericksburg, crossing the river via pontoon bridges and looked to quickly seize the town and move on to Richmond. The attack hinged on the arrival of these pontoon bridges. The pontoons were late in arriving and as the Union Army anxiously waited, Robert E. Lee and the Confederate Army prepared to meet the Union Army in the heights above the City. The fighting at Fredericksburg would become famous for this Union assault on Marye’s Heights. 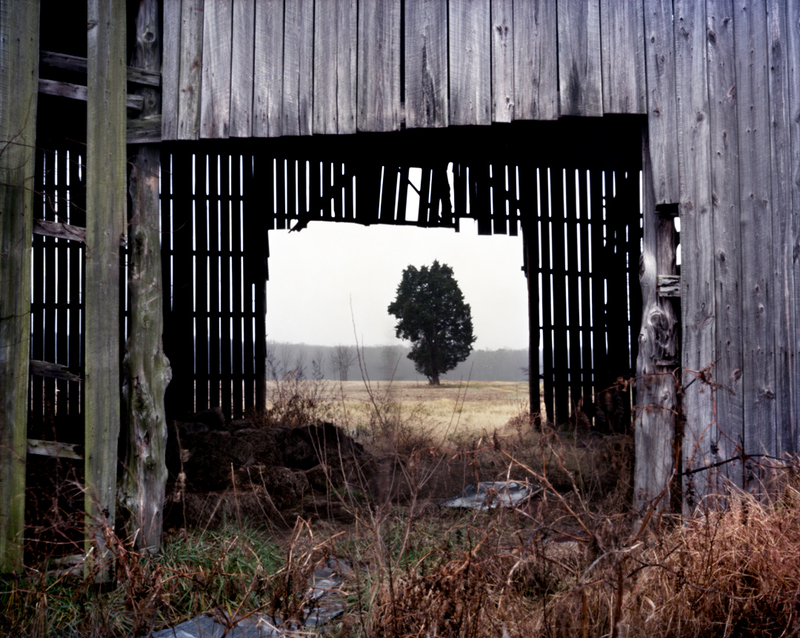 Here, behind a stone wall, Confederate troops mowed down repeated Union assaults – fourteen in all – and eventually left 8,000 Union casualties on the fields and approaches to the Heights. 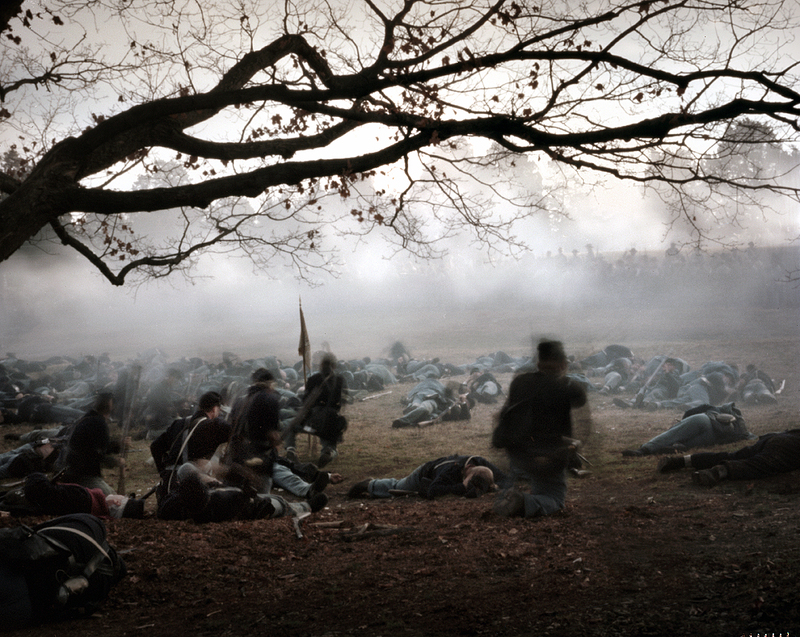 The Battle of Fredericksburg would be a devastating Union defeat and lead to a Union withdrawal from Fredericksburg. The Fredericksburg Battlefield visitors center is on Marye’s Heights scene of the famous fight at the stone wall. 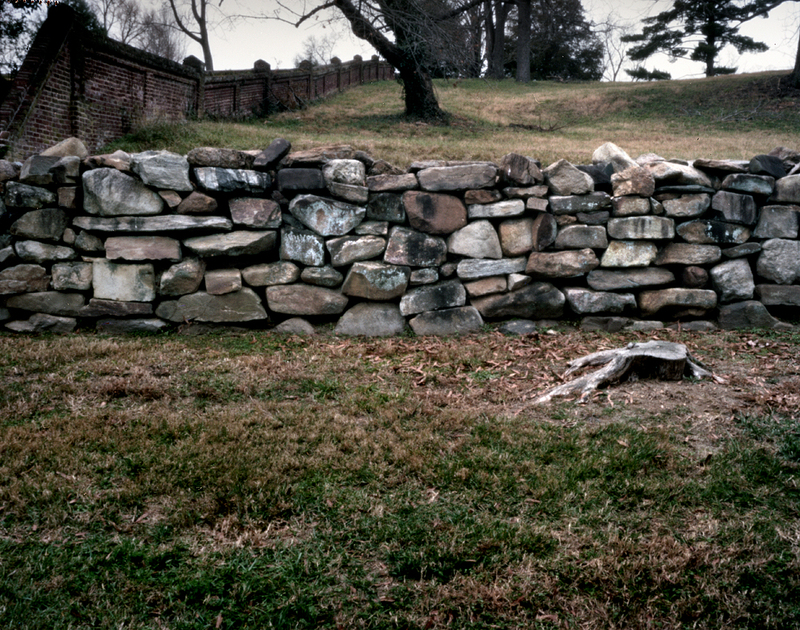 That stone wall remains and is situated behind the visitors center, the stone wall partially rebuilt since the battle. The Innis House is also there – a small home, the inside riddled with bullet holes, still. The outside of the building now restored – was riddled with bullet holes, and was taken apart by the owner and sold as battle relics in the days after the battle. One of the compelling things about this trip was “Fire on the Rappahannock” -the reenactment planned for the weekend. The reenactment groups had secured the help of the Army Corps of Engineers to build a pontoon bridge, across the Rappahannock at the Ferry Farm City Dock crossing. This was roughly where, in 1862, one of the three Union Pontoon bridges were constructed to get troops across the river during the battle. 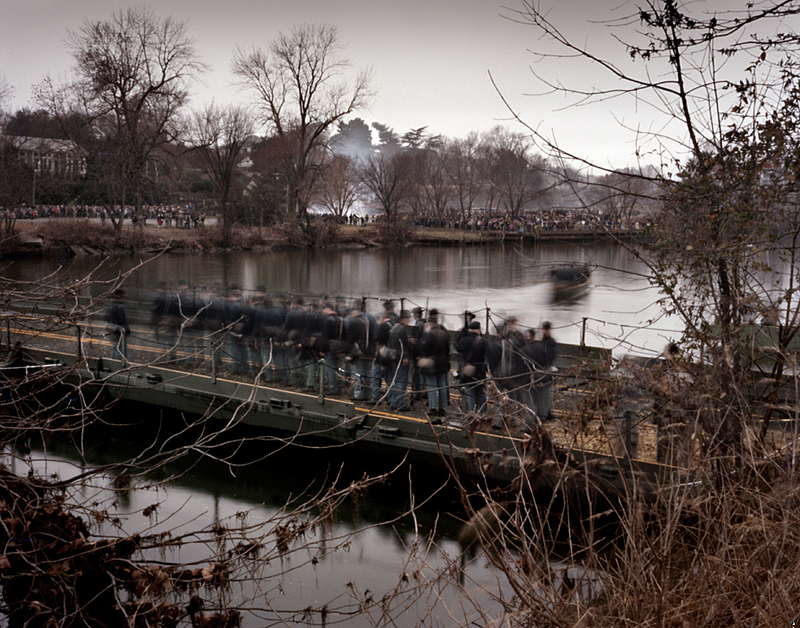 Reenactors also built two period wooden pontoon boats to reenact the amphibious landings by Union troops after the Federal bridge engineers were fired upon by Confederates within the town of Fredericksburg. The reenactment would continue with street fighting in the City of Fredericksburg itself, and a reenactment of the Battle of Marye’s Heights on nearby Trench Hill. The pontoon and boat crossings were things I hadn’t seen yet in a civil war reenactment. They would provide great photo possibilities. Saturday, dawn: Ferry Farm was the site of Union troop embarkation to the City of Fredericksburg that terrible day in 1862. In 2012 there was a palpable excitement in the Union reenactment camp at the Ferry Farm as to the coming activities. Union reenactors were issued green briars for their kepis to honor the Irish Brigade which took a heavy toll during the battle , and began to form up for their march to the river. 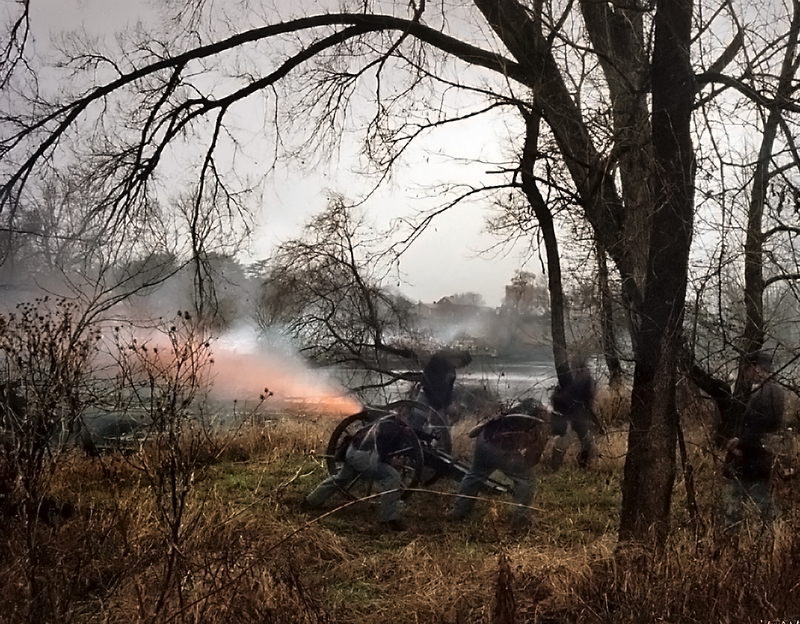 As firing started, artillery along the river bank, infantry troops firing from across the river, Union reenactors lining up for the pontoon crossing- the anticipation began to build. 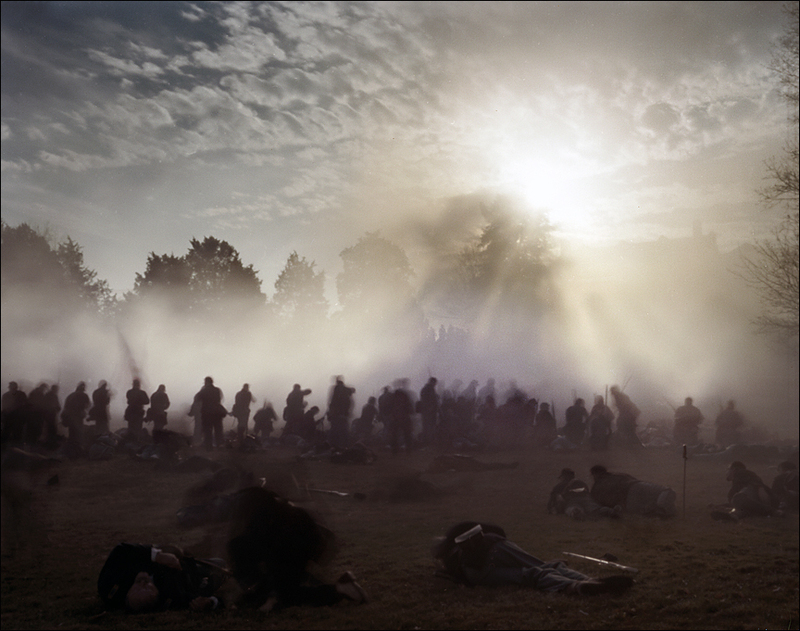 The “Fog of War” is something mentioned often in accounts of battles; this applies to reenactments as well. Like real battles, the reenactments are “planned”, but even with planning things don’t always go exactly according to plan. The pontoon bridge erected by the A.C.E. was about eight feet too short! This may have been due to the tidal aspects of the river, needless to say it resulted in a comical decision that had to be made on the spot: to take off or not your shoes before making the plunge! Army personnel stood in that freezing water, waist deep, and helped the reenactors get across and up the steep, muddy river bank. I opted to take off my shoes….the water was freezing. Thousands of spectators lined the streets of Fredericksburg as the Union troops were once again marched through the City. They were bitterly opposed by the retreating Confederates who slowly made their way toward the defensive ground on Marye’s Heights. As they marched and fought through the City’s streets, Fredericksburg residents dressed as 19th century civilians, mingling with modern spectators, jeered, many screaming “Yankee go home!” Double yellow lines down the streets, traffic signs, power lines, all made this “street fighting” difficult to photograph, in color, with the pinhole camera. However, the next reenactment, the fight on Marye’s Heights, was a gift. Reenactors had built a “stone wall” 100 ft long plywood, painted structure, on Trench Hill to replicate the stone wall on the real Marye’s Height just a block or so away. This fight, in late afternoon, began with a Union approach up the streets, Confederate troops slowing them as they approached the stone wall. This battle is famous for the continual attacks made by Gen Burnside’s troops against this defensive position held by the confederates commanding the Heights. Wave after wave of Union troops stormed up the hill but only got within 100 yards before being stopped cold by massed Confederate fire. The reenactment played this out with successive waves of reenactors marching into the teeth of the guns. By the end of the hour-long reenactment, Union soldiers lay piled up in front of the stone wall and presented a pretty gruesome sight to the spectators. 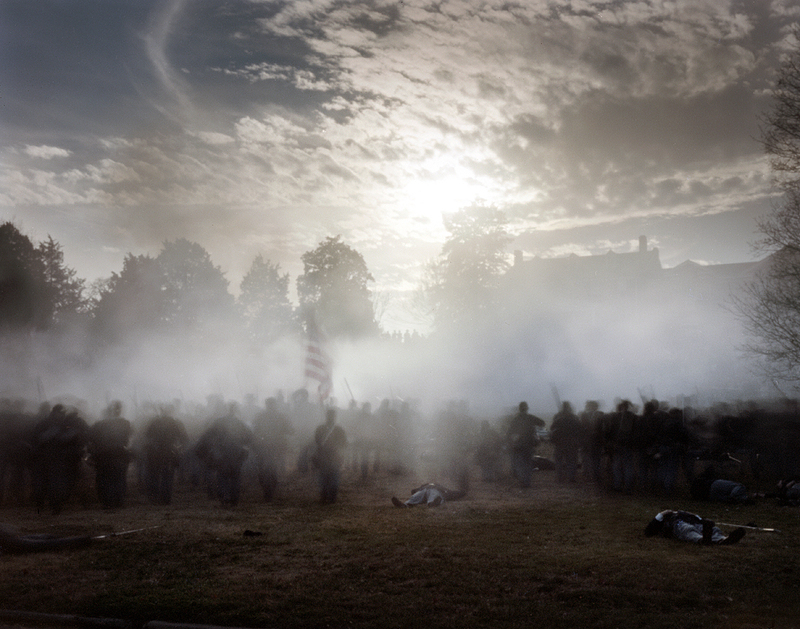 The late day winter light mingling with clouds of gun smoke creating a breath-taking scene… Although I was well aware I was witnessing a reenactment the sight of hundreds of men, laying and writhing on the ground, seemed surreal and disconcerting. I spoke with reenactor Mark McNierny about his experience at Fredericksburg in 2012. McNierny with his long blonde hair, goatee and mustache took the impression of one the many Union officers that led their troops in the fighting on Marye’s Heights. He related the moment he led his troops charging the stone wall, how he dramatically fell, his sword flying through the air, and after writhing on the ground as if pierced by an imaginary bullet. Afterwards McNierny, while shaking a Confederate reenactors hand, the fellow confessed to Mark that he been transfixed by this “performance” during the battle. He described watching a “Union officer” charge with the troops, all the guns thundering, power smoke blinding at times and McNierny going down, shot. His fellow reenactor had been moved to tears, transfixed, by what this “wounded officer” represented to history, and the carnage at Fredericksburg in 1862. This description is what living historians call a “period rush”… a complete sensory experience. The Marye’s Heights reenactment ended with a beautiful rendition of Taps bringing a hush to the thousands gathered there. The crowd cheers as the Union and Confederate reenactors shake hands over the stonewall and congratulate each other on a well fought fight. The following day at dawn I visited the Slaughter Pen Farm on the southern portion of the Fredericksburg Battlefield. The morning was foggy and overcast with a light drizzle of rain. The wide open fields of the Slaughter Pen Farm are quiet in the soft morning light…a train whistle breaks the silence as a mile long freight train roles through the scene. 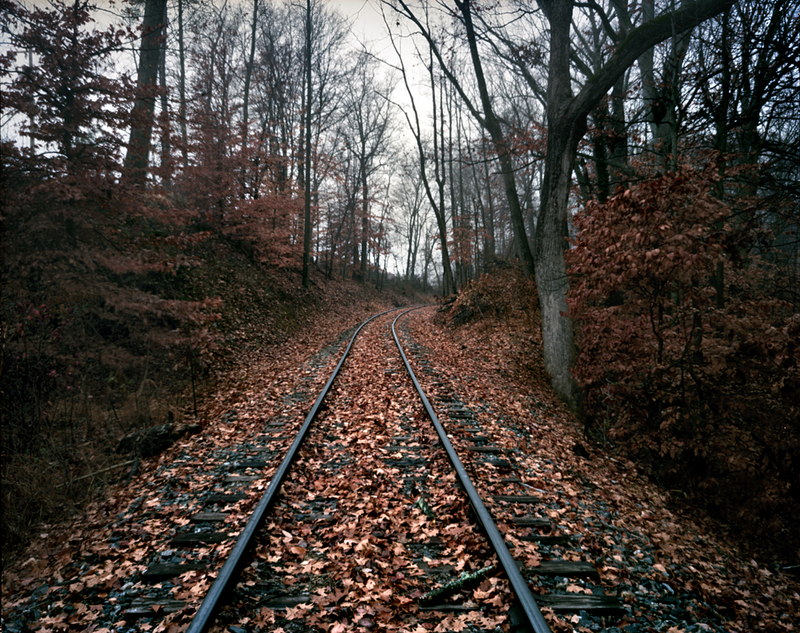 The Slaughter Pen Farm is still abutted by an active railroad line as it was in 1862. 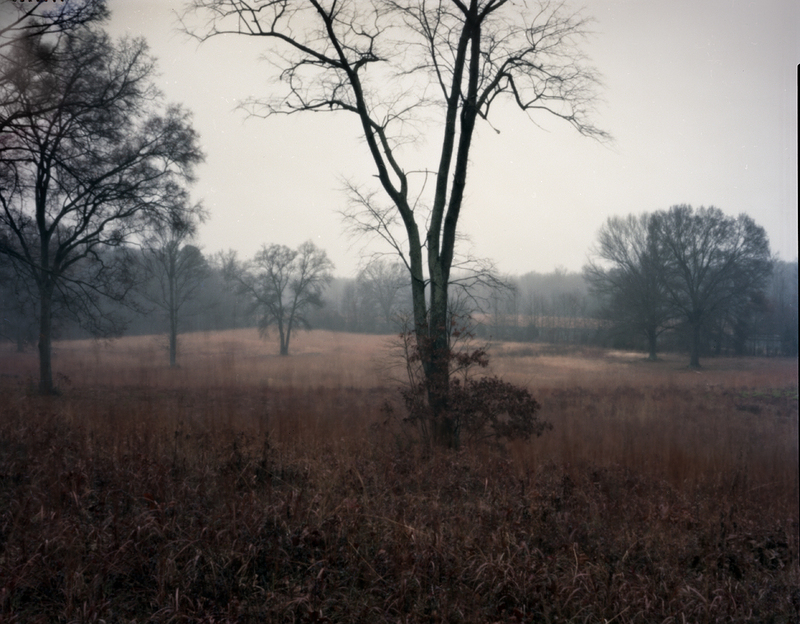 Dense fog blanketed the landscape on December 13th 1862 as Union troops attacked across this ground. 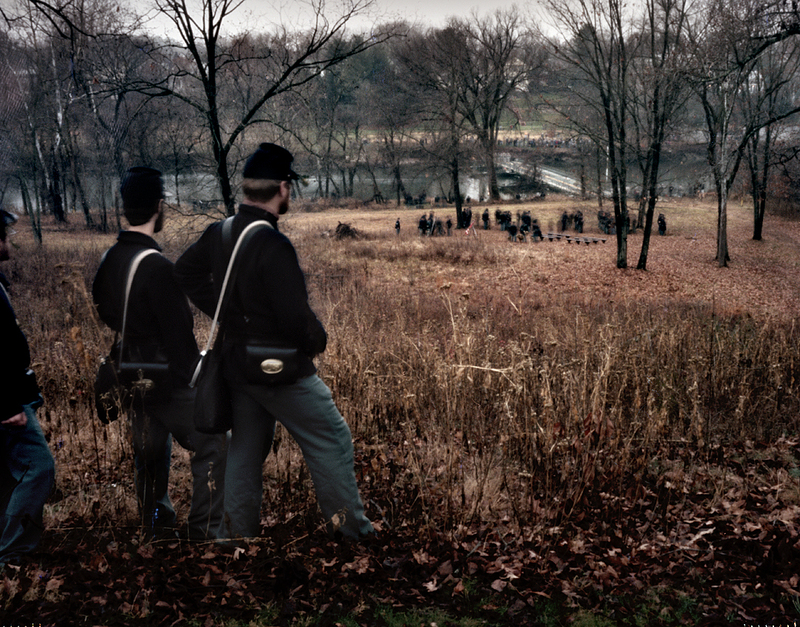 The Federals made it to the railroad embankment before being stopped by a storm of steel coming from the Confederate earthworks positioned along Prospect Hill. The 35,000 Confederates fighting on Prospect Hill were commanded by Stonewall Jackson, securely entrenched and commanding the high ground. Federal troops made headway but were ultimately repulsed becoming pinned-down along the railroad embankment. Looking at this high ground today its easy to see the advantage the Confederates had here that December morning. I was lucky to be seeing the battlefield in similar weather. Walking along Prospect Hill in a light foggy drizzle was strangely beautiful, subtle and revealing. You can clearly see the Union approaches, and the not too distant RR embankment. 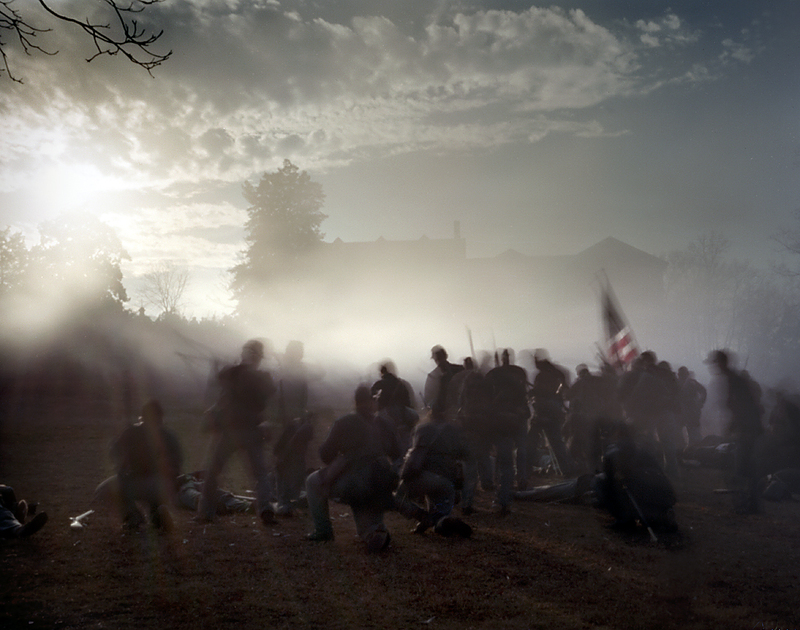 The light being similar to the actual day in 1862 made the experience even more intense and moving. 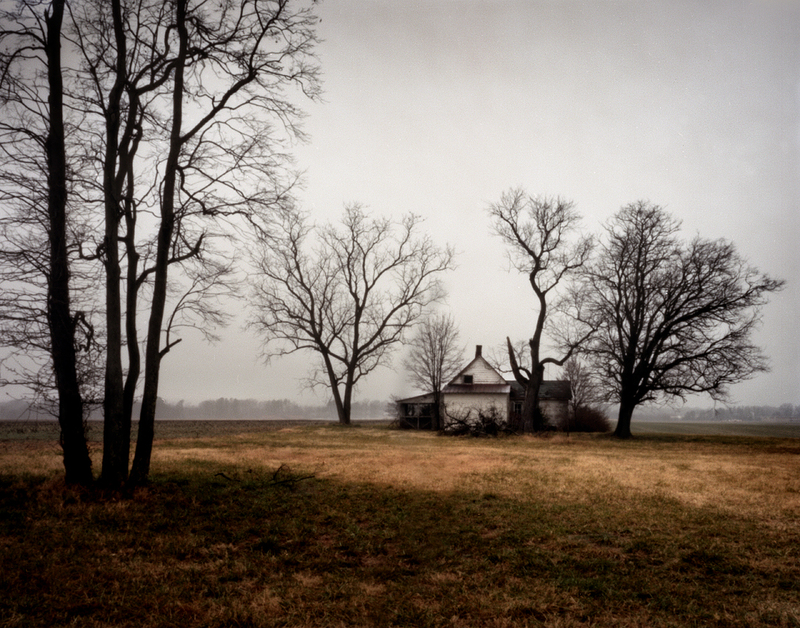 It was nice to photograph a battlefield in winter, with stark leafless trees, rain and mist: very beautiful. Prospect Hill looking toward the railroad embankment and Union approach on December 13th 1862. 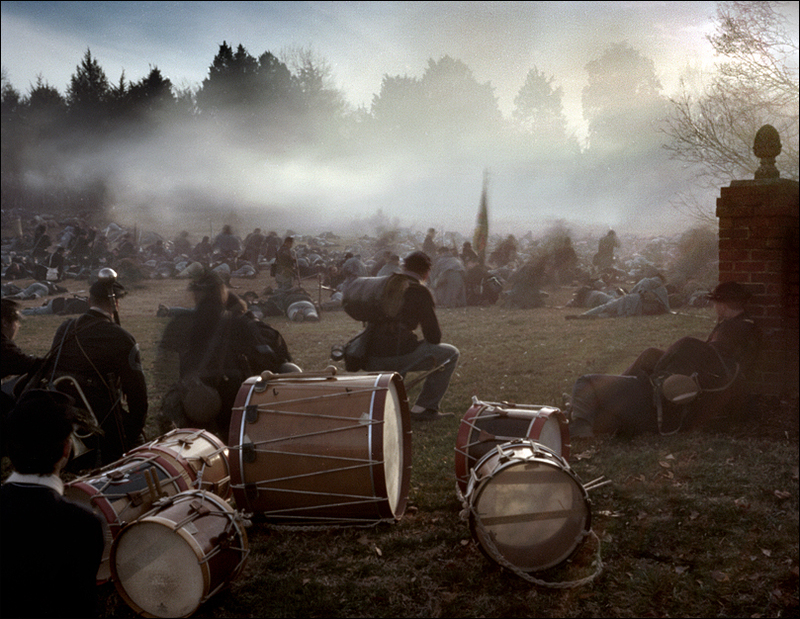 Michael – I’m curious what your average exposure time is during the battle photos? michael, for the reenactments i’m using 400 asa film, i generally pushed the film one stop to 800 asa. On a bright sunny day exposure time can be as short as 1-4 sec and after that basically as long as you want. The pinhole aperture is so small that, depending on the light, the difference between an exposure of, say, one minute and two minutes, is nil. That daylight exposure may seem short but an overcast day, exposures can be 1.5 minutes to 6 minutes, the difference can be quite dramatic. This has been a remarkable and thoroughly commendable presentation. Kudos to all responsible, especially the photographer. Wonderful photos…huzzah! We are glad you came out.